Mission: To facilitate hemp's return to American agriculture and the expansion of hemp technology across all applicable industries(food,textiles,paper,plastics,energy,etc...). Hemp's potential is beyond our imagination, Won't you help in the waking of the Nation? Hey now, what are we gonna do, now to create a clean future? It's time to shake off all the sand, rise on up and take a stand. We all know that we're facing problems. Open minds will be what helps us solve them. As we try to chart a course to help our planet grow more stable. Hemp's a crop can heal our water, air, and soil. The last time we really grew it here was during the Second War. A course of action that we cannot afford. Hey now, what are we gonna do, to create a clean future? It’s time to shake off all the sand, rise on up and take a stand. You know we’ll have to take it to the streets, so our farmers can once again grow hemp. Hemp History Week let's take it to the streets, help our farmers can once again grow hemp. Can be made greener from this plant that springs up from the soil. Unlike those cotton crops where they spread them far and wide. Let's plant hemp instead and we can reap a yearly harvest. Hemp's potential is beyond our imagination. Won't you help in the waking of the Nation? Hemp History week let's take it to the streets, help our farmers once again grow hemp. If you take a look at causes Environmental, what you’ll find are lots of scattered causes local. The way I see it we’ve been like a shotgun shell, trying to hit far-off “Target Sustainable”. We’ve got to mold ourselves into a bullet, then this target, oh, I know that we can hit it. Then we’ll really help the Earth’s health to restore. We’re going to shake off all the sand, rise on up and take a stand. Hemp History Week we'll take it to the streets, help our farmers can once again grow hemp. Hemp History Week we'll take it to the streets, help our farmers once again grow hemp. A friend of mine recently put together a survey for a ethnography research methods class on the topic of creating effective hemp education and promoting hemp awareness. Below are a few of my responses. To participate yourself, leave a comment and I'll pass your info along. What is your educational platform (or pro-hemp argument) that you use when doing hemp outreach? My main “argument” is that if we are truly serious about maximizing the growth of the green economy and creating a sustainable future, industrial hemp must become, once again, one of the United States’ primary crops. I stress how cultivating hemp will do more to help clean our air, soil, and water than any patented technology our scientists can offer. I include hemp nutritional benefits and communicate how making more hemp foods available to our citizens, we can improve the quality of life of many and reduce our long term health care costs. With younger people, I’ll maybe emphasize the sustainability and social justice (Alex White Plume and his efforts to grow hemp on sovreigh land) angles. Talk of mass movements in US History and how bringing hemp back requires the same public involvement. With older people, I’ll maybe include more details about hemp’s place in World and US History, and emphasize the importance that future generations are left with the cleanest possible air, soil, water, and food that we can pass on to them. It just depends on the situation and the group dynamics. Hemp is such a multi-disciplinary plant, if you know what I mean, and this definitely leads to a wide variety of topics to touch upon as they relate to hemp. What are the various tools (i.e. brochures, movies etc.) that you use when you provide hemp education? I’ve used a wide variety of tools which I share with people in my educational efforts, including books, movies, videos, and brochures; links to articles, videos, and web sites; letters to representatives and editors of various newspapers; and the song I wrote, Hemp Anthem which I’ve played at open mics and done as spoken word at poetry slams. 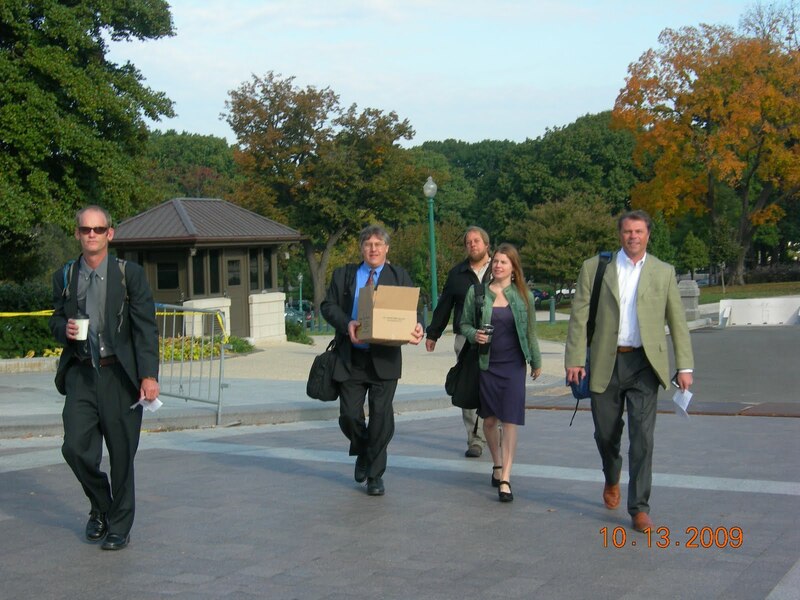 A few weeks ago I had an article published in the Hemp Industries Association Newsletter titled, Lobbying for Hemp. In this article I share some of my experiences in Washington DC along with some insight into why it is still illegal for US farmers to cultivate this beneficial and versatile crop. As we head into Spring-time and a renewed push for hemp farming in America, I hope you will take the time to read it, pass it along to friends, and participate in the writing of an exciting new chapter in US hemp history. Recently Minnesota started a new chapter in their hemp history with their legislature's introduction of the Minnesota Hemp Development Act. I learned more about this bill this morning when I read an article published by Politics in Minnesota, "Can Hemp Grow Jobs?" Below is the comment I posted there. I encourage you to read "Can Hemp Grow Jobs" and participate in this discussion by posting your own comments there, and/or sharing this information with your friends, family, and colleagues. I applaud Rep. Kahn and her fellow co-authors of the Industrial Hemp Development Act. The more legislatures pass hemp bills, the harder it will be for Congress to deny American farmers the right to grow a crop that can stimulate rural community development and the green economy. As someone who has educated myself for over 20 years about industrial hemp, I firmly believe that the longer we deny our farmers the right to grow this crop, the deeper we continue to dig the economic and environmental holes from which we are all trying to climb out. To Rep. Cornish and the members of the Public Safety Committee, I would ask that they set aside their preconceived notions about hemp, and its relationship to marijuana, and give this bill the consideration it deserves. I find it unfortunate, that before even holding a hearing, Rep Cornish’s wants to “take this bill and shred it and let one of our pipe smokers smoke it,” Such an attitude is the antithesis of representative democracy and public debate. Rather than inviting only US law enforcement officials spouting off the usual list of”threats” hemp poses, I would suggest the committee invite some Canadian law enforcement officials to their hearing and listen to what they have to say on the subject. Prior to 1998, Canadian law enforcement voiced the same fears. Twelve years later, they can assure you that hemp cultivation has had no impact of their ability to uphold their marijuana laws. When the people lead, the leaders will follow, and I encourage all Minnesotans to help lead this country to a sustainable future by voicing your support to your Representatives for passage of the Industrial Hemp Development Act. H.R. 1866 is perhaps the most straight-forward Act currently in Congress and deserves the support of all Americans. It would reflect science, by making a clear distinction between hemp and marijuana; and also grant each state the power to regulate hemp cultivation within their borders. We the People of the United States of America must not allow Congress to continue preventing our farmers from cultivating this crop that help can heal our environment and stimulate the expansion of the green economy like nothing else out there. I ask you to please do your part by using this link to let your Representative know that you want them to co-sponsor this bill and join the other 18 Representatives who have already done so. Without more co-sponsors this bill is not likely to get the committee hearings that it deserves. I know from the time I recently spent in Washington, D.C. that without more constituents like yourself contacting their Representatives, they will continue standing on the sidelines and perpetuating the flawed federal hemp policies of the last 70 years, a course of action that we can not afford. I know that with the wealth of information available on line, it's sometimes hard for folks to find the type of up to date information they're looking for, without bouncing all around the internet. If you want a great source in one location for hemp related articles, reports, videos, etc... this could be the link you've been looking for. The personal action I did in front of the White House provides a sneak peak of sorts for the type of actions I would like to plan for Industrial Hemp Action Day. Please check it out and pass it along. I'm a former 1st grade teacher who has chosen to direct my actions towards maximizing hemp's potential to create a more sustainable future for our children, and help build the global green economy.